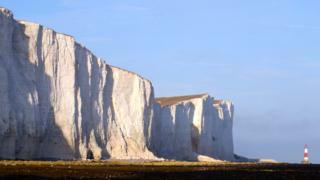 Recent centuries have seen a big jump in the rates of erosion in the iconic chalk cliffs on England's south coast. A new study finds that for thousands of years the rocks were being beaten back by the waves at perhaps 2-6cm a year. The past 150 years has seen this retreat accelerate 10-fold, to more than 20cm a year. The group believes the findings will help us understand some of the coming impacts of climate change. "Our coasts are going to change in the future as a result of sea-level rise and perhaps increased storminess, and we want this work to inform better forecasts of erosion," Dr Hurst, currently affiliated to Glasgow University, told BBC News. Originally laid down 90 million years ago, these soft chalk faces are now being eaten away by the relentless pounding they get from the sea. Dr Hurst's team was able to estimate the pace of this reversal by examining the amount of beryllium-10 in nodules of flint embedded in the eroded platform in front of the cliffs. The radioactive element is produced when cosmic rays - that constantly shower the Earth - hit oxygen atoms in the flints' quartz minerals. The longer the nodules have been exposed, the greater their build-up of beryllium-10. At Beachy Head and Hope Gap, the gently sloping platform, which is only uncovered at low tide, extends seaward several hundred metres. It represents all that is left after millennia of cliff removal. "The lower rates of erosion that we report - about 2.5cm at Hope Gap and around 6cm at Beachy Head - are averaged over that timeframe - through about the past 7,000 years of the Holocene," explained Dr Hurst. "But comparing that to observations based on topographic maps and aerial photography of the last 150 years - the difference is quite stark. These historical observations from 1870 to the present suggest erosion rates of 20-30cm a year at the two sites." The estimates of change in the deep past are tricky because the platform appears younger than it really is. This stems from the fact that its surface continues to erode downwards, removing its oldest exposed flints. The regular tidal covering of water also has to be considered because it will restrict the flux of cosmic rays reaching the platform, thus limiting the amount of beryllium that can be induced in the nodules. But the team is confident in its analysis and puts forward some ideas to explain the recent big up-tick in erosion. These concern the available gravels at the foot of the cliffs that constitute the beach. Ordinarily, this material acts as a buffer, limiting the energy of crashing waves. But there is good evidence that the beaches in this region of the south coast have got thinner through time and perhaps therefore offer less protection today than they once did. In the modern era, groynes and sea walls have been erected further down the coast and these may have interfered with the along-shore transport of gravels. And further back in time, several hundred years ago, it is possible also that there was a phase of more storms. These could have removed significant volumes of gravel and pushed the rates of erosion into a new, more aggressive regime that persists even now. Co-author Dr Dylan Rood from Imperial College London told BBC News: "The coast is clearly eroding, and Britain has retreated fast. A nearly tenfold increase in retreat rates over a very short timescale, in geological terms, is remarkable. "The UK cannot leave the issue of cliff erosion unresolved in the face of a warming world and rising sea levels. Cliff erosion is irreversible; once the cliffs retreat, they are gone for good."